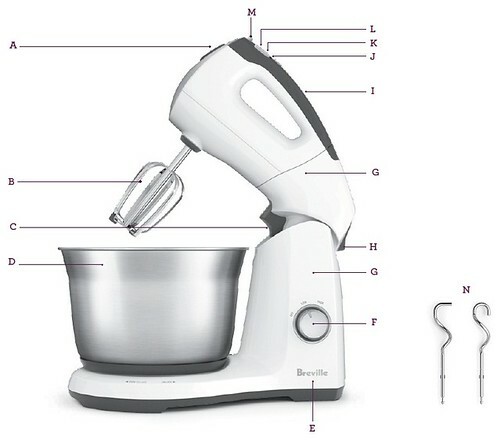 The Breville Handy Stand Mixer™ — hand mix or stand mix, with spring loaded, soft tipped beaters and two independent motors. One motor spins the bowl while the other controls the beating action. Handy! A. Beater/Dough Hook Release Button. B. Twin Beater Action. C. Hand Mixer Release Button. D. Motorized Bowl. E. Mixer Stand. F. LOW/HIGH Control Switch. G. Two Motors - One drives the attachments, one drives the bowl. H. Tilt Back button. I. 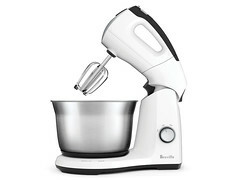 Hand Mixer. J. Boost Button. K. Timer - LCD Display. L. 12 Speed - LCD Display.